Is Posttraumatic Stress Disorder (PTSD) an illness that arises after horrific and life-threatening events? Or is it a label that medicalizes human suffering, and brings with it more problems than it solves? Still a relatively new diagnosis, PTSD has changed our vocabulary and shaped our views on human coping and resilience. Yet almost every assumption upon which the diagnosis rests has come under question. In this volume, Gerald Rosen brings together leading international scholars in posttraumatic studies to consider the most contentious debates. Each chapter offers an analysis of the issues, reviews current research, and clarifies implications for the practicing clinician. 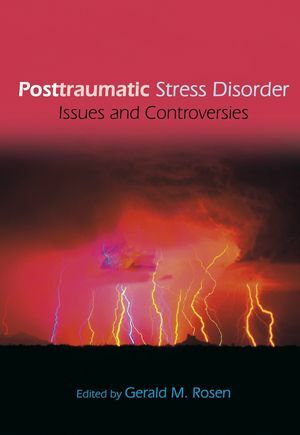 Posttraumatic Stress Disorder: Issues and Controversies is essential reading for all practitioners, researchers, and students who work in the field of trauma. Professionals in related health fields and the law will also find this book useful. Gerald M. Rosen has a private practice in Clinical Psychology, and holds an appointment as Clinical Professor in the Department of Psychology at the University of Washington, Seattle. He is on the Editorial Board of The Scientific Review of Mental Health Practice, and has published peer-reviewed articles on professional issues in the treatment and assessment of Posttraumatic Stress Disorder. 1. Conceptual Problems with the DSM-IV Criteria for Posttraumatic Stress Disorder (Richard J. McNally). 2. Risk Factors and the Adversity-Stress Model (Marilyn L. Bowman and Rachel Yehuda). 3. Risk Factors and PTSD: A Historian’s Perspective (Ben Shephard). 4. Unresolved Issues in the Assessment of Trauma Exposure and Posttraumatic Reactions (B. Christopher Frueh, Jon D. Elhai, and Danny G. Kaloupek). 5. Malingering and the PTSD Data Base (Gerald M. Rosen). 6. Psychophysiologic Reactivity: Implications for Conceptualizing PTSD (Scott P. Orr, Richard J. McNally, Gerald M. Rosen, and Arieh Y. Shalev). 7. When Traumatic Memory Was a Problem: On the Historical Antecedents of PTSD (Allan Young). 8. On the Uniqueness of Trauma Memories in PTSD (Lori A. Zoellner and Joyce N. Bittenger). 9. Memory, Trauma, and Dissociation (Steven J. Lynn, Joshua A. Knox, Oliver Fassler, Scott O. Lilienfeld, and Elizabeth F. Loftus). 10. In the Aftermath of Trauma: Normative Reactions and Early Interventions (Richard A. Bryant). 11. “First Do No Harm:” Emerging Guidelines for the Treatment of Posttraumatic Reactions (James D. Herbert and Marc Sageman). 12. Cross-cultural Perspectives on the Medicalization of Human Suffering (Derek Summerfield).